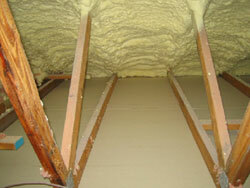 Attic insulation incorrectly installed – Spray foam insulation has been installed directly on the roof sheathing in this unheated attic eliminating ventilation of the attic space. Overheating due to solar energy will likely seriously reduce sheathing and shingle life. 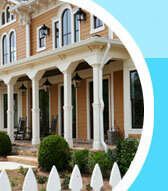 Recommend removal and re-insulation with adequate venting. Bathroom vent directly to attic – A bathroom ventilation fan exhausting moist air directly into the unheated attic is a major contributor to mould, mildew and rot. Vent fans must be exhausted directly to the outdoors. 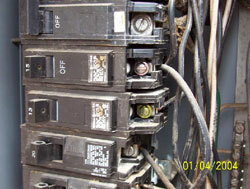 Incorrect wiring in electrical panel – Two circuits have been connected to one 15 amp breaker ( known as a “double tap”) Only one circuit should be connected to a breaker of this type. “ Double Taps” can result in circuit overloading and excessive heat build up, A serious safety hazard requiring immediate attention by a qualified electrician. 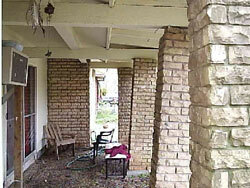 Leaning columns – Brick support columns are leaning due to inadequate footing installation. The deck structure is subject to collapse. Immediate action is required to correct this accident waiting to happen. Poor ground connection- This electrical system ground wire is attached to the cold water supply pipe but the wire insulation has not been removed. Electrical contact is possibly not complete. A serious safety issue requiring immediate correction. 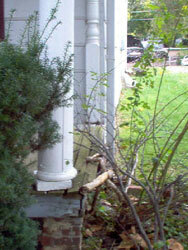 Rotted column base – Deterioration of this column and structure have weakened the support originally intended. Repair is needed. Tree damage to roof shingles- Branches from a tree next to the house have worn and abraded the roof shingles reducing their ability to shed water. 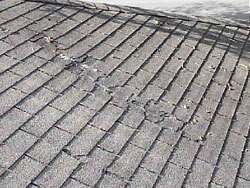 Shingles require replacement and branches should be cut back to prevent damage. 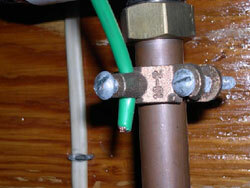 Unprotected live wire – A live wire with bare ends resting on a copper water line. Gives a new definition to a “hot” shower. A dangerous safety hazard requiring immediate attention by a qualified electrician. 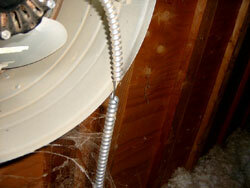 Worn attic fan wiring – Vibration of this attic fan has worn through the wire insulation. 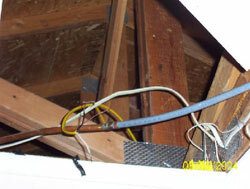 An electrical short can be expected at any time and this wire requires immediate replacement. 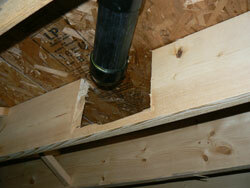 Cut floor joist – An example of “new construction” where a floor joist has been cut to accommodate plumbing pipes. 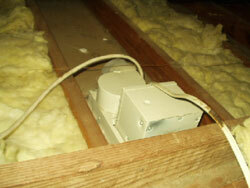 This joist no longer provides adequate support to the floor above and requires reinforcement.